Allscripts is one of the largest public companies focused exclusively on healthcare information technology globally. Allscripts offers healthcare providers, payers and life sciences companies globally a complete portfolio of clinical, financial, population health management, transaction and managed IT services and other solutions. As of December 31, 2018, we had approximately 9,500 employees worldwide. For 2018, non-GAAP revenue was $2.1 billion. We have clients and operations in 17 countries including Australia, Canada, India, Israel and the United Kingdom. Our industry leading client base consists of over 75,000 physician practices, 3,400 hospitals and 17.5 million connected consumers through FollowMyHealth®. We invite investors to learn more about Allscripts and the impact we have on health care around the globe - To learn more, visit www.allscripts.com, Twitter, YouTube and It Takes A Community: The Allscripts Blog. 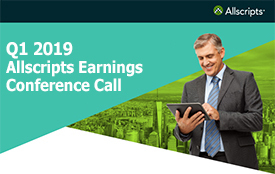 Or please contact Stephen Shulstein, Vice President of Investor Relations at Stephen.shulstein@allscripts.com.